TOKAJI.com .::. 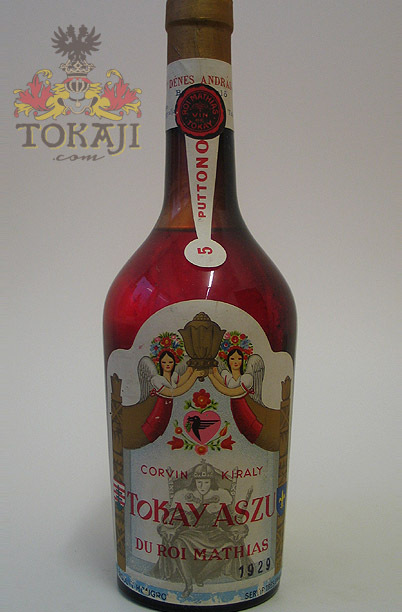 Buy Historic Tokaji : 1929 Tokay Aszú du Roi Mathias 5 put. You are here: Home BUY TOKAJI Buy Historic Tokaji 1929 Tokay Aszú du Roi Mathias 5 put. 1929 Tokay Aszú du Roi Mathias 5 put. Very interesting bottling from the 1930s for the French market, imported into France by Seignouret Fréres & Cie. The wine comes from the lesser known producer András Szalay Dénes, who had vineyards in Tolcsva and Tállya. The label refers to the Hungarian King Matthias Corvinus (1443-1490). The bottles come from a very old French cellar, where the youngest bottle dated from 1939. András Szalay Dénes was a quite unknown producer, who was running the winery together with his wife. They had vineyards in Tállya and Tolcsva. It seems they exported higher quantities to France in collaboration with the French wine importers Seignouret Fréres & Cie., since their "Tokay Aszú du Roi Mathias" (especially the 1929 vintage) can be found from time to time in French cellars still today. Seignouret Fréres & Cie is still today one of the oldest trading houses in the Bordeaux marketplace (founded in 1830) and was owner of Château Dillon until 1956.